A peaceful end to a SWAT standoff at a home in Bellaire today. Around 12:40 p.m., Houston Police said the suspect was taken into custody. Houston Police Assistant Chief L J Satterwhite and Bellaire Police briefed reporters on the SWAT scene at 4813 Tamarisk. No one was hurt. View on Google Chrome or another browser. 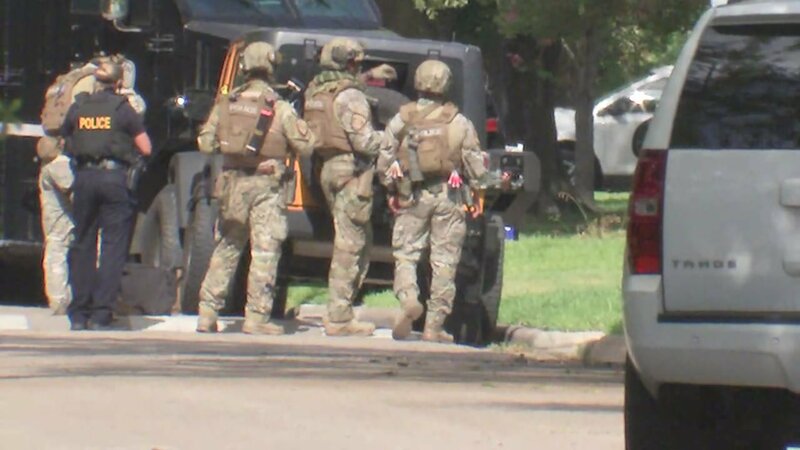 Before 11 a.m. today, Bellaire Police and Houston Police tweeted SWAT was on the scene in the 4800 block of Tamarisk. Bellaire Police said an armed suspect was inside a vacant home. Immediate area residents were instructed to stay in their homes. This entry was posted in Asian Community Alert, Harris County News, Houston Crime News and tagged Armed Suspect Search in Bellaire. Bookmark the permalink.